[Pamphlet case designed and handmade by Douglas Cockerell for a manuscript letter by Richard Phillips, Governor of Nova Scotia, c. 1719]. 38 x 25.5 cm. 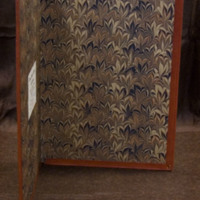 A unique binding for a protective pamphlet case which housed a letter from Governor Phillips to Lord Townsend, England’s Secretary of State. 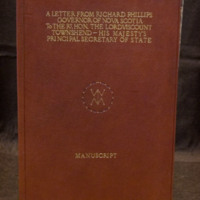 The document being encased is an early and important one in documenting Nova Scotia’s colonial history. The binding reflects this importance by displaying a full unabbreviated title in an elegant and expertly applied type.